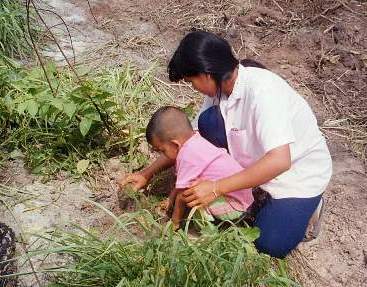 In tropical countries, tree planting can protect soil and watersheds, provide food, animal fodder, building materials, regenerate degraded land, protect coastal environments (mangroves) and support many types of income-generating activities for the world's poorest peoples. Planting appropriate tree species is one low-tech answer to boosting food supplies on millions of hectares of degraded land in the tropics. 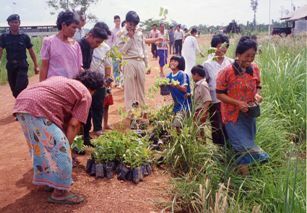 Teaching people who live in these areas how to plant trees — through local forestry, agriculture, development etc agencies — is also probably the most cost-effective way to remove carbon from the atmosphere. This basic technology has been available for decades, but information dissemination is the problem. The aim of Tropical Trees for Life is to help this process by being an information source for community forestry, agroforestry and multipurpose tree species. 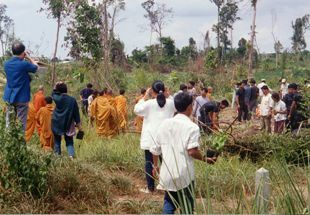 Pictures show a Thai village community replanting a degraded forest — sponsored by the Regional Community Forestry Training Centre, Bangkok (RECOFTC).